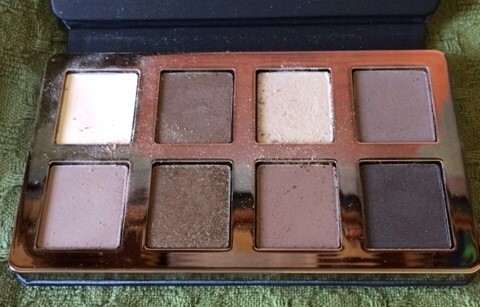 Last Friday I posted on the new Bobbi Brown greige eye shadow palette. I did have the opportunity to speak with a consultant on Saturday, regarding the best way to apply the shadow. Initially, I found the product a bit uncooperative. The consultant suggested that, after I load my brush, I should pat on the shadow, as opposed to brushing it on. I found this to be great advice! I am still in the “getting to know you” phase and not completely sure I will buy Bobbi Brown again. That said, I am having fun with experimenting! 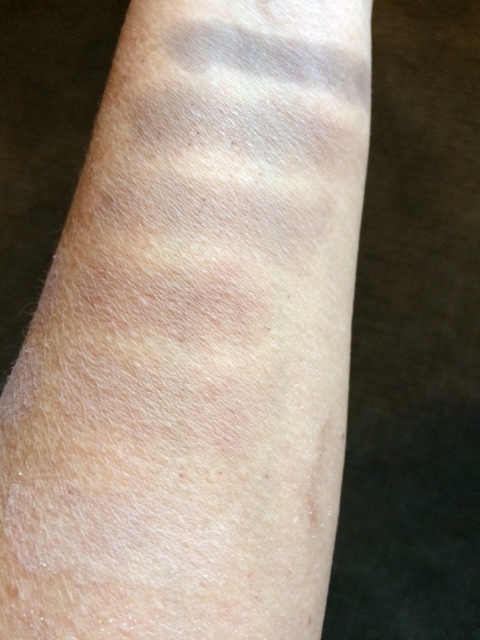 Following up–One of my readers asked for swatches so I have included a shot of swatch for all! top left , bottom left , bottom 3, top 4, top 3, bottom 4. The remaining 2 shadows–top 3 and bottom 2–are sparkly micas. Quite honestly, they don’t seem to make much of an impact at all. It might just be me! You will need to be your own judge. Previous:Wondrous Wednesdays: to be or [k]not to be…. I must admit, i have been loving this palette. I create a smokey eye with it and it works great for a day time look.